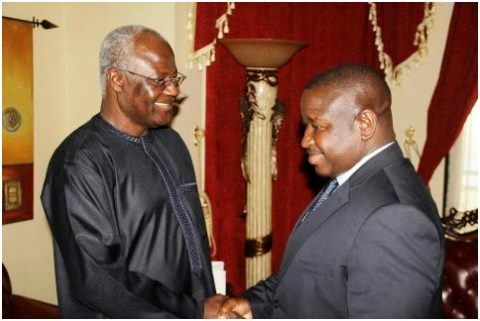 Sierra Leone’s new president Julius Maada Bio has announced the first set of his Cabinet ministers. In a statement from Sate House on Thursday, Bio named 12 ministers, among them veteran politician and lawyer Charles Francis Margai as Attorney General and Minister of Justice. Margai, a renowned constitutional lawyer, was one of 16 contestants in the March 7 first round presidential election. He backed Bio in the second round on March 31. Dr Alpha Timbo is Minister of Primary and Secondary Education. The health and Sanitation docket goes to Dr Alpha Wurie; Energy ministry goes to Alhaji Kanja Sesay. Mohamed Swaray is the Minister of Information and Communication; Mrs Emms Kowa is Minister for Marine Resources; Labour and Social Security is headed by Adenkunle Joliff Milton-King; Water Resources by Dr Jonathan Tengbe), and Ms Baindu Dassama is Minister of Social Welfare, Gender and Children’s Affairs. There were also appointments for Internal Affairs (Edward A. Suluku); and for Deputy Defence Minister, Brig. (rtd) Simeon N. Sheriff. Bio also named his long-term personal assistant, Yusuf Keketoma Sandi, as Press Secretary, and Sahr Lahai Jusu as Financial Secretary. All ministerial appointees are subject to approval by parliament as per the country’s constitution. The appointments come a few days before the expiry of the mandate of the Transition Team set up by President Bio, which was tasked with stock-taking to ascertain the state of affairs of the government ministries, departments and agencies under the outgoing Ernest Bai Koroma government. The presidency statement also said further appointments were expected in due course.